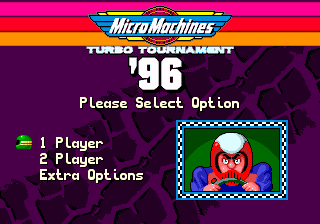 Micro Machines: Turbo Tournament '96 is a sequel to Micro Machines 2: Turbo Tournament, released exclusively on the Sega Mega Drive in Europe. Micro Machines 96 ups the total track count to 85, with 40 of these being in "all new environments" (each environment (or tileset) being used for at least three tracks). The game also recycles graphics from its predecessor, partly due to Codemasters believing that the difficulty of the previous title meant many of these old environments were missed. A major addition to Micro Machines 96 is the "construction kit", allowing users to create their own tracks. Players can save up to 10 tracks within the cartridge's internal memory, or generate a string of characters from the data (i.e. a "password"). While initially hinted that the Mega Drive construction kit would be superior to the Micro Machines 2 version for DOS (which gives the player the ability to alter graphics pixel-by-pixel), users can only switch between pre-defined graphics sets for both the vehicles and scenery. Main article: Micro Machines: Turbo Tournament '96/Magazine articles.